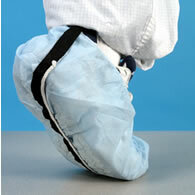 Polypropylene ESD shoe covers are made of 100% spun-bond polypropylene. This non-woven fabric helps filter particles for contamination control in critical environments. The regular sole shoe covers are available in universal or extra large sizes with comfortable elastic ankles to fit over most shoes. Skid-free soles are available for greater traction and improved safety. Covers with conductive strips are also available for static sensitive applications. Conductive strip covers heel only. IEST-RP-CC003.2 Recommended Practice for Cleanroom Garments Classification specification exists for this item, an independent test laboratory would classify particle cleanliness into high Category I or low Category II. Skid-Free Shoe Covers with Conductive Strips are an economical way to protect static sensitive devices in the work area and protect workers from injury. 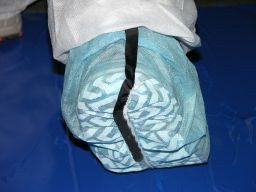 A full length non-woven conductive carbon strip is added to the bottom of our Shoe Covers: regular sole polypropylene, skid free polypropylene, and polylatex. The strip provides adequate length for body contact when worn with most shoe styles. Shoe covers are sized in extra large for versatility.